of onsite Oxygen and Nitrogen Generators. Controlled Atmosphere Stores, Water Treatment and Aquaculture applications throughout Africa. We were approached by Africa’s largest copper producer to provide a turnkey solution for their laboratory gas distribution system. Foxolution handled the entire project from start to finish which included the terminal point design, laboratory gas pipeline distribution, integration of new components with existing, on-site safety audits, freight & logistics, complete installation as well as comprehensive operator training. 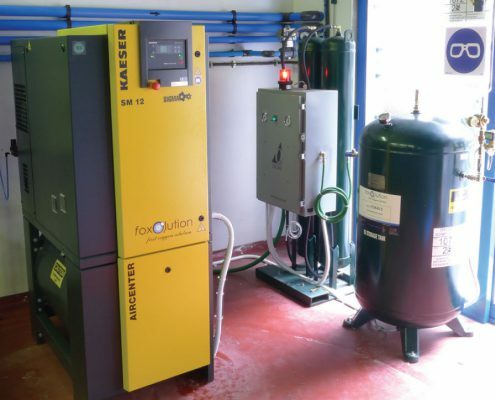 An onsite oxygen generating system built and designed for Aquaculture specialists, Deep Blue Aqua. This system was designed to provide oxygen at multiple outlets for dosing large volume tanks for various fish species, under the watchful eye of the Government owned marine research center. In case of power outages, the option exists to connect backup cylinders which automatically switch over when power to the system is removed, ensuring a continuous supply. 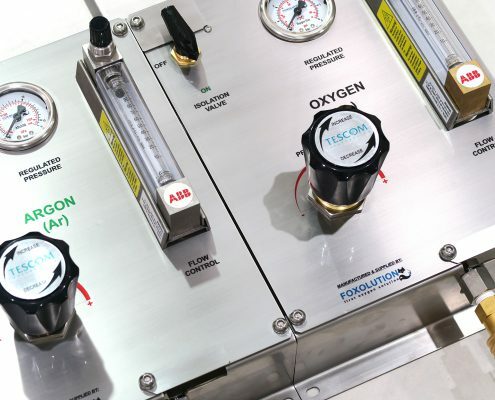 One of many such systems that we have successfully installed throughout Africa, this containerized oxygen supply and filling system allows the user to fill small and large cylinders, all from an intuitive touch screen. The system includes air conditioning for interior climate control, real time gas (CO/CO2/O2), temperature, pressure and dew point monitoring. The system has enhanced safety features, a host of built in alarms and is supplied with full operator training and user manuals. 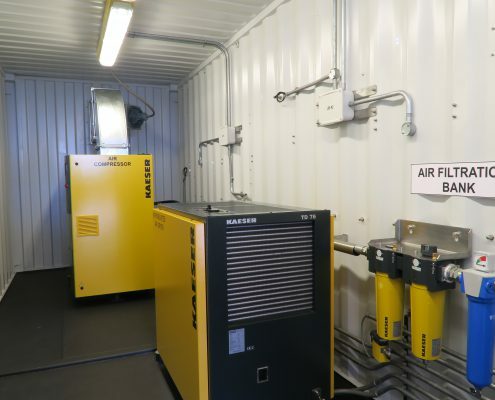 For this project, we retrofitted a standard 20ft shipping container and converted it into an onsite oxygen cylinder filling system for a US based Non-Profit Organization. The system is used to fill oxygen cylinders for medical use and has been built to the most stringent international standards. Ambient conditions were carefully considered so that the volume of oxygen produced would meet, and generally exceed client requirements. 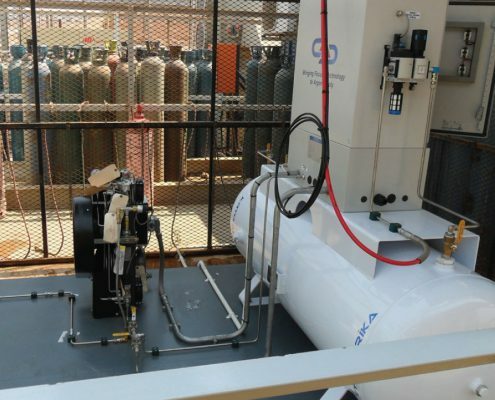 This skid mounted system which allows for the filling of Argon cylinders from a bulk supply, was specially designed & developed for a leading African Cryogenic gas supplier, Kryo Afrika. 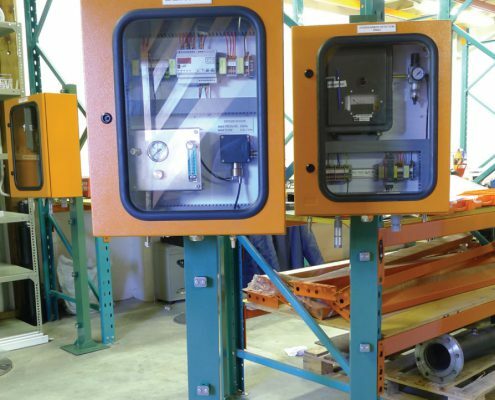 An expertly designed electro-pneumatic panel controls the filling process with field devices providing instant and precise feedback for accuracy and operator safety. 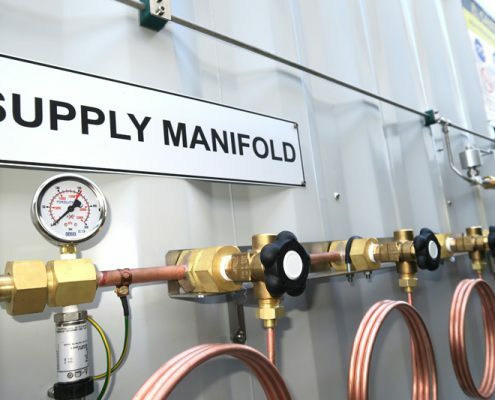 The skid mounted system incorporates a 5 way filling manifold and provision has been made for a forklift to easily transport and position the entire system onsite.